(CNN) -- France's Thomas Levet claimed a two-shot halfway lead after a five-under 67 at the Spanish Open on the PGA Catalunya course in Girona. Levet plays an iron-shot approach during his second round of 67 in Girona. After his first round 64, it leaves Levet on 13-under 131, with Denmark's Soren Hansen his nearest challenger. Hansen had set a course record 63 in the opening round but took seven shots more on Friday to lose his lead. Two-time major winner John Daly continued his steady form on his comeback to competitive golf with a level par 72. It left him inside the cut mark on two-under 142, but European Ryder Cup captain Colin Montgomerie crashed out after a sorry nine over par 81. Daly, who has not played in nearly four months and is serving a six-month ban on the PGA Tour, mixed four birdies with four bogeys. 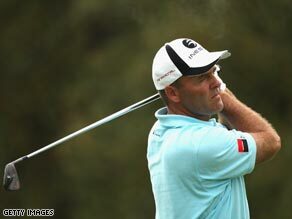 Former Ryder Cup star Levet said he played well despite battling a bad back which he claimed to have picked up while working with French television at the Masters. "It's since working with you guys," he joked with reporters. "I'm not a sitting person -- I'm a standing person. "I spent hours in a chair and it started getting stiff. There were also two long flights and it's been bad for three weeks." Hansen, the only member of last year's Ryder Cup team not to qualify for the Players Championship in Florida next week, looked set to join him at 13-under but double bogeyed his last hole. Defending champion Peter Lawrie of Ireland, who started at the 10th, charged through his final nine holes on the front nine in just 30 shots for a 66. He is firmly in the hunt on 10 under ahead of the weekend while Alejandro Canizares leads the home challenge after a 69 which left him eight under alongside England's Chris Woods.